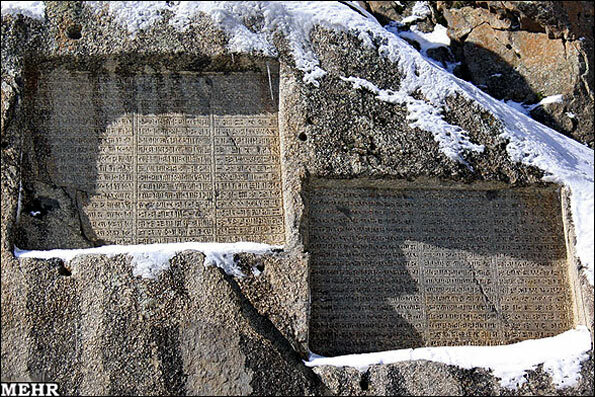 Introduction:The Ganj Nameh (Persian: گنج نامه) are set of cuneiform characters written in three languages (ancient Persian, Elamite, and Babylonian), set into a rock face on Mount Alvand, about 5 kilometers from modern-day Hamadan which once served as the capital of the Medes and Achaemenids. The scripts describe the conquests of two Achaemeniad Kings namely, Darius and his son Xerxes who call Ahuramazda for help. However, the later generations who could not read the cuneiform alphabets of the ancient Persian, Elamite and Babilian scripts, thought it was the guide to an uncovered treasury. The two tablets are set in stones as protection from the elements and written in 3 languages in cuneiform writing. The tablet on the right side embraces the name of Xerxes and the one on the left bears the name of Darius the Great. "The mighty lord is Ahuramazda, the god of gods, who created this land, the sky and the people, the same god who brought people happiness, who appointed Xerxes as king, the unique king of kings, the unique ruler of the rulers, I am Xerxes, the great king, king of kings, king of multinational countries, king of this large land, the son of Darius the Achaemenid." This translation corresponds with part of the inscription attributed to Xerxes at the main entrance of Persepolis and the other plate inscription of Ganj Nameh attributed to Darius the first, the father of Xerxes, had the same sentences with the difference that instead of Xerxes it has the name of Darius. These two plates too, similar to the majority of inscriptions by the Achaemenid kings include greetings to Ahuramazda and the fathers and forefathers of these kings. Today two new carved tablets have been added in the parking lot of this site with modern Farsi and its English translation. One noticeable element while visiting this site is a large number of surrounding landscapes both cultural and natural. Best time to visit: No limit,Spring is the best time. 2- Take a bus ticket to Hamedan.Distance from Tehran to Hamedan is 342 Km. 3- Take a Taxi to Ganj Nameh. Ganjnameh is an ancient inscription, 5 kilometers southwest of Hamedan, into a rockface on the side of Alvand Mountain in Hamedan province. It sits along the ancient Imperial Road, connecting the Achaemenid capital Ecbatana to Babylonia. It was thus a safe and frequently traveled road and had much visibility during the Achaemeniad period. The inscriptions were first studied in detail by the French painter and archaeologist Eugene Flandin during the 19th century. Subsequently Sir Henry Rawlinson, a British explorer, used the inscriptions to decipher the cuneiform characters of the era. This ancient site is in the vicinity of a natural waterfall, adding to the beauty of the scene. The inscription, which has been carved in granite, is composed of two sections which describe the conquests of two Achaemenid Kings, Darius (521-485 BC) on the left and his son Xerxes (485-65 BC) on the right. Both sections have been carved in three ancient languages of Old Persian, Neo-Babylonian and Neo-Elamite and consist of three columns of twenty lines. They start with praise of Ahura Mazda and describe the lineage and deeds of the mentioned Kings. "The Great God [is] Ahuramazda, greatest of all the gods, who created the earth and the sky and the people; who made Xerxes king, and outstanding king as outstanding ruler among innumerable rulers; I [am] the great king Xerxes, king of kings, king of lands with numerous inhabitants, king of this vast kingdom with far-away territories, son of the Achaemenid monarch Darius." The later generations who could not read the Cuneiform alphabets of the ancient Persian assumed that they contained the guide to an uncovered treasure; hence they called it Ganjnameh which literally means "treasure book", but it has also been called Jangnameh meaning "war book", possibly due to the wrong assumption that the inscriptions described ancient wars of the Achaemenid era. Surrounding the inscriptions are small holes, possibly indicating that there used to be some form of covering to protect the inscriptions from natural elements such as wind and rain. Today two new carved tablets have been placed in the site's parking lot with Persian explanation and its English translation. Unfortunately, this archeological site is in danger while no protection is sought. Today restaurants and entertainment centers constructed in the vicinity of Ganjnameh have changed the historic atmosphere of this ancient site and endangered the cultural and natural landscape of the area. Adding to these existing problems is the construction of a cable car nearby. Ganjnameh, in the distance of 5 Kills southwest of Hamedan, is located all one of the Mount Alvand foothills, in the pleasant valley of Abas Abad. Near Ganjnamch, one can see a beautiful view of Ganjnameh waterfall, pleasant and green valleys of Abbas Abad, Tarik Darrell, and Kivarestan. In addition. Tarik Darreh is divided into two branches: easterly, ski establishment and westerly on the Garlook pass the new road and the old cart track cut each other. This valley in Achaemenid period was on the beginning of the Hegmataneh ­Estakhr road which was known as Imperial Rout and connected Hegmataneh nlong Tarik Darreh. Garlook valley, Vardavard 0liya Shahrestaneh, Oshtoran, Tuyserkan.,Nahavand, Kermanshah, Lorestan, Persepolise to Fars. In addition, it was the road which connects Hamedan to the west and east of the country and Mesopotamia in Iraq. Since ancient Hegmataneh was the Achaemenid summer capital and located along the Imperial Route, Darius the first after engraving the Bistun Inscription ordered to encrave another inscriptions in Ganjnameh. Then his son Xerxes engraved another one on the right side and a little lower than his falher's inscription (about 500 BC).
" A great god is Ahuramazda, who created this earth, who created yonder sky, who created man, who created happiness for man, who made Darius king, one king of many, one lord of many. I am Darius the Great King, King of Kings, King of countries containing all kinds of men, King in this great earth far and wide, son of Hystaspes, an Achamenian." Both inscriptions have the same Content except the name Xerxes instead of Darius, Vishtasb instead of Darius and the phrase; "hyah maoistah baganam" which means; " who is the greatest God" in the Xerxes inscription. These inscriptions had different names. Ebn-e Faghih Hamedani in his book "Akhbar Oh-Soldan" called them "Tab Nabar." Their other names are "Sangnebeshteh, Nebesht Khodayan. Katibeh ha-ye Alvand. Jang Nameh and Ganjnameh, the two last ones have been used recenty. It is registered as a National and historical Iranian monument No. 92 dated 6.1.1931. In 1995 the English and Persian translation of these Inscriptions have been engraved on two granite rocks by Hamedan municipal and they have been placed in the other part of Ganjnameh.